An injured Scooter is found by a human, but then captured and reprogrammed into a Renegade. 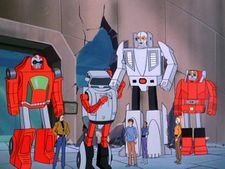 At a secret UNECOM science facility in Utah, Leader-1, Turbo, and their human friends watch as Professor von Joy works to upgrade the Guardians' Power Suits. Von Joy takes the opportunity to show off his latest invention, the Quasi-Sonic Renegade Detection Unit, but the device quickly proves it's not yet up to snuff when it reads Nick as a Renegade. Elsewhere in the base, Scooter is grumbling as he performance some solo maintenance, when the machine he is working on detects the arrival of a meteor nearby. Puzzled by the readings, Scooter heads out to investigate without telling anyone. When he arrives at the impact site, he is suddenly attacked by a metallic tentacle that snakes out of the crater—a weapon sent by the Renegades as part of a plan to get past the science facility's forcefield! Scooter converts to vehicle mode to try and get away, but the tentacle has done its work; his neuro-circuits affected, he passes out. Before the Renegades arrive to capture him, however, a passing motorist named Clive spots him at the side of the road, and, thinking he is just an ordinary motor scooter, picks him up and puts him in his van. "Excuse me, sir, do you have a moment to talk about our zord and savior, Zod? Sir? Sir!" When Leader-1 and company return to the facility the next day, they are surprised to find no trace of Scooter. Learning about the meteor from the base computers, they retrace their missing comrade's steps and discover the tentacle-thing, which is blasted to goop by Leader-1 when it tries to attack him. Meanwhile, Turbo and A.J. go searching for their lost little buddy, and stumble across him on the highway, being ridden around by his new "owner." When Clive realizes that they are following him, he takes the exit to Salt Lake City and tries to lose them in the city streets. 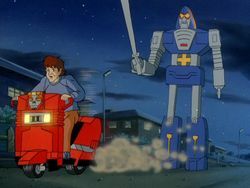 Turbo keeps on his tail until, attempting to turn on his headlights, Clive accidentally activates Scooter's hologram generator, which disguises the GoBot as a truck and causes Turbo to drive right on by. No sooner has Clive ditched his Guardian pursuer, however, than he is suddenly set upon by Cop-Tur, who knocks him out and absconds with the still-inactive Scooter. Turbo and A.J. search through the night, and eventually come upon Clive just as he reawakens. 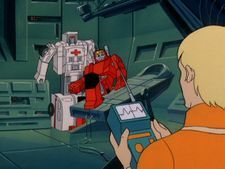 Recognizing Cop-Tur from his description, they take him back to the science facility where he is interrogated and locked up until the situation can be resolved. Resolution seems to be imminent when Scooter soon comes driving up to the base... but as guards Blaster and Defendor let him in, they have no way of knowing that the Renegades have brainwashed Scooter, and have sent him into the base with orders to interface with the man computer and then self-destruct, thereby knocking out the forcefield! Despite the uncharacteristically coarse personality exhibited by the brainwashed "Renegade Scooter," the Guardians are too thankful to have their friend back safe to have any suspicions—a feeling that starts to change when Scooter refuses to submit to examination by Rest-Q. Nick decides to take the finished Renegade Detection Unit for a test, but figures it must still be broken when it beeps at Scooter. 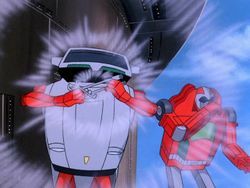 Watching through Scooter's eyes, Cy-Kill sends Crasher and Pincher to eliminate the boy and the device. 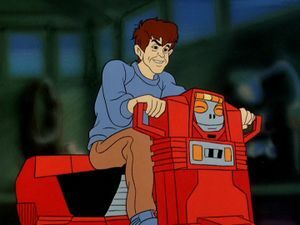 The two Renegades catch up to Nick as he is walking through a nearby town, but fortunately, Leader-1 has followed the boy, suspecting that the villains may be lurking nearby and believing they are responsible for doing something to Scooter's mind. Leader-1 and Nick return to the base just in time to receive the news that Clive has escaped his cell, but this development works out in the Guardians' favour when Clive spots "his scooter" just as he is carrying out Cy-Kill's orders. Clive tries to jump on Scooter to make a getaway, but winds up knocking the GoBot away from the computer and into a power bank. The resultant electric shock knocks both Scooter and the base's forcefield offline, leaving Cy-Kill to think his scheme has gone off as planned. Turbo finds Clive and suspects him of being a saboteur, but when Scooter awakens a moment later, back in his right mind, he is able to explain everything that has happened. Now properly filled in, the Guardians are ready for the Renegades when they arrive, and engage them in a furious firefight. The Renegades are outnumbered but fight viciously, until Professor von Joy attempts to use a new weapon of his to end the fight quickly. Whatever the weapon is supposed to do is left unclear, but it doesn't matter, because it backfires, releasing a blinding light that dazzles the Guardians. The Renegades use the distraction to escape, but the Guardians consider the day won, offering their condolences to von Joy over the failure of his weapon, and their thanks to Clive for inadvertently saving the day. Matt: "The Professor always cracks me up with his wild inventions!" Nick: "Some of 'em are really great!" Leader-1: "Ha! He's a little crazy, but his gadgets come in very handy!" —and he's available in stores now, kids! "My mom always told me never to take rides from strangers... and I've never seen anything stranger than you!" "Innnncompetents! You two have the combined brain capacity of a dishwasher!" "Zis vill end ze battle mach schnell!" Leader-1: "Thanks, Clive. We owe you something. How 'bout an apology?" Clive: "Ahh, forget it. Savin' the world's no big deal!" Scooter: "Yeah! We do it all the time!" 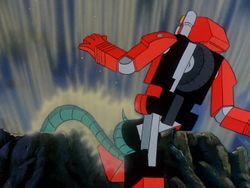 Pincher, Roguestar, and the Power Suits are given origin stories much later in the series during the "GoBotron Saga" mini-series; in particular, Roguestar is shown to be in an incomplete state during the mini-series, while from this episode onward, it is in finished condition. Consequently, that entire mini-series—in which Defendor, von Joy, Scratch, and the redesigned Blaster all appear—must take place before this episode. 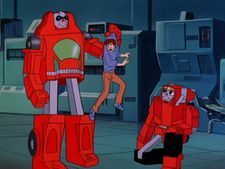 Given Nick's up-close-and-personal encounter with Pincher in this episode, the later episode "Nova Beam," in which he does not recognize the Monster GoBot, must also occur before "It's the Thought that Counts." Thus, "Nova Beam" features the first chronological appearance of the completed Roguestar. The presence of Snoop among the Renegades means these events must fall after those of "Cy-Kill's Cataclysmic Trap," in which Snoop is unknown to the Guardians and poses as a member of their ranks. 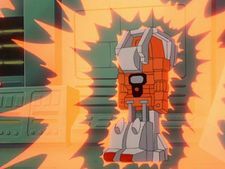 Scratch being active on Earth means this episode must occur after "Genius and Son," which features him on his first Guardian duty. All that said, "It's the Thought that Counts" certainly seems written as an "introduction" to von Joy for audiences, spotlighting his "wild inventions" with some very on-the-nose dialogue from Matt and Leader-1, and letting him have the save-the-day moment at the end, even if it doesn't go as planned and they never explain what it was he was even trying to do. 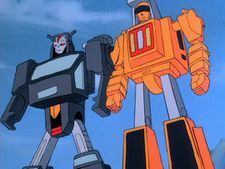 Dozer puts in two quick cameos occupying the Power Suit von Joy tests, and is later converting to his robot mode as part of the Guardian that surprise Cy-Kill near the end. Having appeared before only briefly in "The Final Conflict," this is his first speaking role; his single line ("Well, how did the Power Suit do?") is provided by Peter Cullen, but he will not reprise the role in future episodes. Scooter opens his chest to reveal an extendable interface cable, which he uses to link up to the base computer. He will use this gadget several times over the course of the series. It's never actually stated this episode takes place in Utah, but we can figure that out from the road signs for Salt Lake City that appear when Turbo and A.J. chase Clive. Hence, the unnamed rocky expanse where the Guardian science base sits is almost certainly somewhere in the state's Great Salt Lake Desert, perhaps the famous Bonneville Salt Flats. 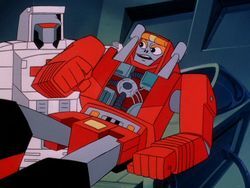 After discovering Scooter's holograms, Clive jokes that the GoBot must belong to James Bond. Clive compares Turbo to the Tin Woodman. A second later, he dubs Cop-Tur a "big Roto-Rooter." Professor Von Joy uses some real German phrases to go along with his Strangelove-esque accent, including "mach schnell" ("very fast") and "Eins, zwei, drei" ("one, two, three"). 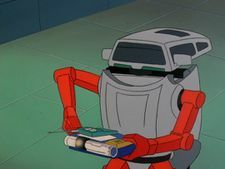 Despite a really obvious scene setting them up at the start of the episode, the improved Power Suits Professor von Joy is working on play no further role in the episode. Likewise, the similarly-set-up Renegade Detector is never actually used to accomplish anything that furthers the plot. It's not just his own gun that von Joy can't get to work... he can't make Chekhov's gun work either! As he and Crasher depart Roguestar for Earth early in the first act, Cy-Kill radios Geeper-Creeper and tells him to meet them on Earth. The unseen Geeper is heard replying, but it then takes until near the end of the second act for him to actually appear, and he never speaks again or does anything other than participate in the big fight at the end. Certain lines of character dialogue indicate there's supposed to be a Command Center in this episode, but a lack of any establishing shots mean it's never actually apparent from the visuals. It's supposed to be what Scooter is performing maintenance on while the others are watching von Joy's demonstration, and Leader-1's team leave it at the base, presumably because Scooter's repairs weren't finished. The first indication of this comes when the Guardians are searching for Scooter, and Leader-1 calls out over the comm "Are you aboard? "—a line that makes no sense if he's referring to the base itself. It is made explicit when Scooter returns and Turbo chides him for "leaving the Command Center unguarded." When Cy-Kill transforms for the first time, his wheels briefly disappear mid-conversion. As Cy-Kill asks Cop-Tur about Scooter's location, a cel of his head animation is not removed and stays visible on-screen, tucked in behind the moving animation of his noggin. The button Cy-Kill presses to activate the brainwashing machine disappears once he has done so. When Cy-Kill orders Crasher and Pincher to "go and play" with Nick, Crasher suddenly disappears. 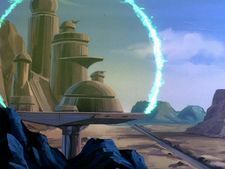 After Leader-1 rescues Nick and the scene fades from an exterior shot of the science facility to Clive's cell, the glowing green effect of the forcefield does not fade out in time with the rest of the animation, lingering for a moment over the shot of the cell before blinking out. When the Guardians surround Professor von Joy after his weapon fails, the cels are stacked incorrectly, making Leader-1's fist appear in front of von Joy instead of behind (right). 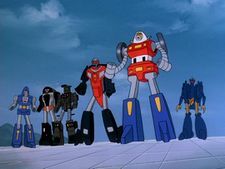 Von Joy is rather small next to the other GoBots; stereotypically and aesthetically appropriate for a scientific non-combatant type, but amusing in a real-world context, as his toy was one of the Super GoBots who towered over the regular figures. In vehicle mode, Scooter's headlights are the buttons from his robot mode abdomen. They have to be, because the actual headlight that sits between his handlebars on his toy was removed from his cartoon character model so his face could go there! Whatever Professor von Joy's weapon is supposed to do isn't explained, but what we can tell you about it is that it's based on the double-barreled gun that came with his toy. This page was last edited on 16 November 2017, at 12:37.